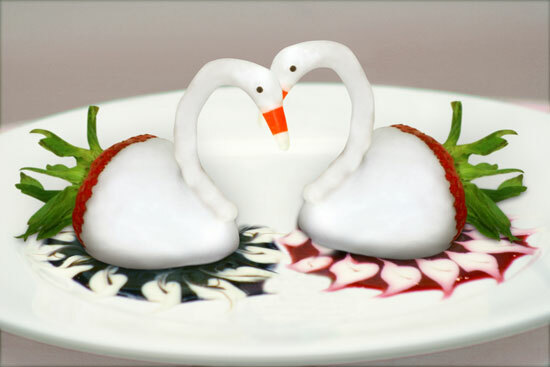 Dipped strawberries creatively made into swans using pretzel pieces and a popular candy! 3. Dip about 3/4 of each strawberry in melted CANDIQUIK®Coating; place on wax paper until set. 4. Break off a side piece of a pretzel twist to create swan’s neck. Dip pretzel piece in melted CANDIQUIK® Coating; place on wax paper until set. 5. Cut off the yellow part of candy corn; cut orange and white piece in half. Attach one of the halves to curved end of dipped pretzel piece with a small dab of CANDIQUIK® Coating. 6. Attach other end of the dipped pretzel piece to the strawberry with a small dab of CANDIQUIK® Coating. 7. Create eyes with decorative icing.